You’ll learn all about the company and their products when you read this Hemb Bombs Review. They are an American based producer and ship all orders from the US. This company is known for their super potent CBD supplements. All products contain pure CBD without any other cannabinoids and are THC-free. They stock a complete line of CBD products, including oils, edibles, vape products, skin care and CBD for pets. Besides that, they have super cool T-shirts and other merchandise. Each Hemp Bombs product contains 100% pure CBD and is THC-free. Great value on the market. Hemp Bombs offers five different strengths of hemp oil, from 300 to 4000 mg. All oils come in a 30 ml bottle with a dropper and there are two flavors to choose from. All Hemb Bombs products are quality tested by an independent third party lab to ensure you get the best product possible. A certificate of Analysis is available on their homepage. The cannabinoid profile of Hemp Bombs is quite simple —it is pure CBD. There are no other cannabinoids and no THC in this product, which means that there is absolutely no chance of getting ‘high’ or failing a drug test. Although there is no risk of either outcome with full-spectrum CBD oil, this stripped-back product will quell any anxieties that first-time users may have. 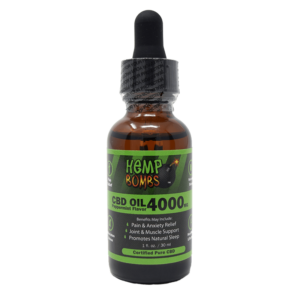 The 4000mg CBD oil has the highest dosage of the Hemp Bombs oil products and is a great choice for those seeking extra security and peace of mind. Hemp Bombs offers one of the highest concentrations of CBD oil compared to other brands on the market and source their cannabidiol from the highest quality organic industrial hemp. In addition, products are tested by the company’s own production quality team and a third-party lab. There are two flavors to choose from, Peppermint and Watermelon. Pure CBD oil is made with only CBD and is free from any other cannabinoids including THC. It is pure, isolated cannabidiol. Full-spectrum CBD oil, on the other hand, contains other cannabinoids and terpenes in small concentrations that enhance the medicinal effects. CBD is one of the many components in cannabis and hemp. CBD is the main cannabinoid in industrial hemp and has the most properties beneficial for our health, which means that it is often isolated for commercial use. However, it turns out that ‘more of the best’ is less than ‘less with the rest’. In 2015 scientists of the University of Jerusalem proved that there is such a thing as ‘entourage effect’. The lab tests done in Jerusalem in 2015 showed that full-spectrum CBD was much more effective than pure CBD. The presence of small amounts of additional cannabinoids and terpenes creates a synergistic effect.